On page 332 of Gimp Bible (2010) it illustrates it in the dialog box, but it is not present in mine. I think that I am running the latest version. (Sep 2, 2011 06:35)ofnuts Wrote: Uh? I see no such tool mentioned on that page, and I don't know of any such variation of the Clone tool. Unless you are confusing it with the Perspective Clone tool? On my page 332 I have Figure 12-8 which is accompanied by the text "The various mouse cursors employed by the Clone Tool (left) and the Clone tool's settings in the Tools Options dialog (right)." 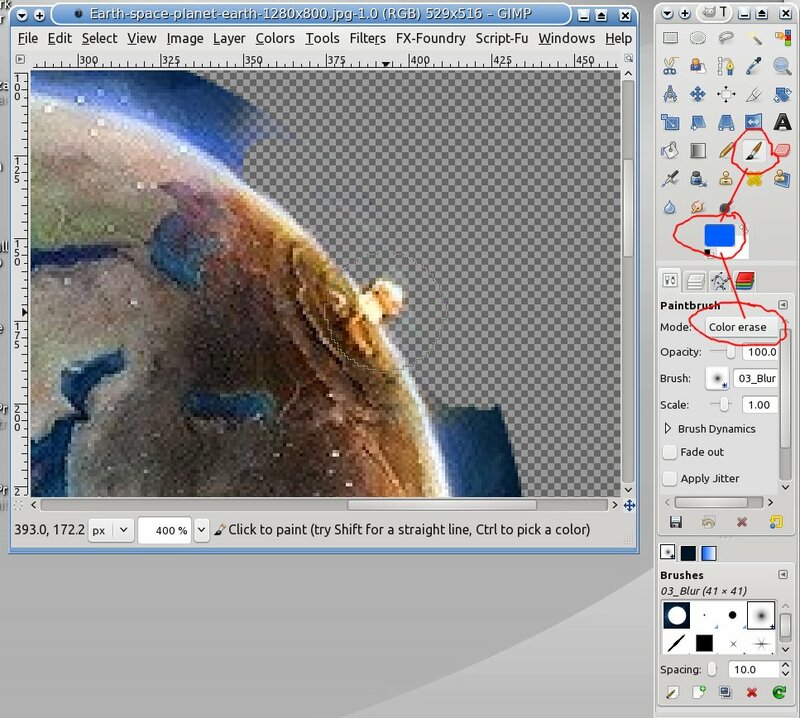 I do not have the "Angle" input box/window as is shown in the illustration. I wonder why not. I am wanting to clone around the periphery of a solid curved object. Say a snake or a circle. What tool should I use for this? I had thought that a sloping line where I could vary the width and the angle of slope would be a solution. But I am open to a recommendation. The author is trying to "future proof" his book. "... GIMP Bible is targeted to cover the features in the stable GIMP 2.8 release. Consequentially, much of this book was written using the GIMP 2.7 development series..."
The brush angle feature is not available in gimp 2.6.x although there is a script which will do this, have a look at http://registry.gimp.org/node/16231 don't know if it works with the clone tool though. Let us say that I have a picture of an antialiased globe superimposed on top of a multicoloured background. Example 1 - I want to make the background transparent. Example 2 - I want to make the background white. Example 3 - I want to make the background blue. In each case I want to finish up with the globe outline being antialiased to the appropriate background. What procedure/tool should I use to accomplish this? So what I am after is the "long and difficult" technique. Is that described anywhere? In any of the books perhaps. I think that I have them all. The problem is everyone wants a quick fix these days and of course every image is different and requires different techniques. More often than not you need to go down to the pixel level and start tweaking the image. "Easy" is making a rough selection and bulk deleting a background. "Tedious" is fixing the fine detail, as ofnuts says, is more likley to be a fuzzy brush and the eraser tool or quick mask. One older technique not mentioned much these days is using the paint tool in color replace mode. Makes for a lot of color selection around the area you are working on but no coincedence that pressing the ctrl key selects a color. Good for something like a globe where the colors are distinct. Still have to be careful though.